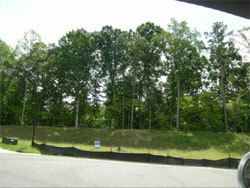 A distance shot of our property shows the hillside and tree-line of our site. A good point of reference that will be lost once the home is built. How fast excavating went. 2 days and you wouldn't even be able to recognize the place. People buy land for a variety of reasons, mostly to have a space of their own. They want to build their dream house and live in a place they can call home. Before you buy land, however, make sure that you weigh the advantages and the disadvantages. One good thing about buying land is that you can find great locations at affordable prices. Parcels that are located far from the city are typically less expensive. The further away they are, the cheaper their acreage. In addition, living in a place far from the city will allow you to breathe cleaner, fresher air. You will be able to enjoy a wider space. You can use wide open spaces to build sheds, install solar panels, and plant different flowers and vegetation. Instead of hearing loud, honking cars in the morning, you will be greeted by chirping birds when you wake up. A simple, quiet life far from the noise and chaos of the city is good for your health and wellness. However, because they are far from hardware stores, supermarkets, restaurant chains, and other establishments, hired labor and delivery of supplies can be expensive. You will need to stock on food, toiletries, toilet paper, and other house supplies if you want to avoid driving to the city often. Obviously, you would be wasting gas, time, and energy if you drive to the city often just to buy a couple of rolls of toilet paper and some groceries. You can expect the transportation of building materials to be costly, as well. In addition, it may be difficult for you to find a skilled craftsman who is willing to travel a long distance. If you find one, he may ask for a higher wage. Even though modern utilities and conveniences are usually available, they are not always reliable in far away places. You may need to buy a generator to serve as a back up source of electricity in case it goes out. Prior to buying the land, it is also ideal to try living in the area for several months. If you are not familiar with the area, it is wise to learn about its history and communities first. Rent an apartment and familiarize yourself with the place. By doing so, you will be able to tell whether your prospective new home is prone to floods, snowstorms, hurricanes, or any other natural disasters. You will also be able to know if the residents are nice, friendly, and honest. Searching for the perfect neighborhood to live in entails proper planning and ample research regarding the area. Use Google Maps to find the location of schools, hospitals, medical clinics and even pharmacies which are closest to the location of your potential home. With the latest innovations done with Google Maps, you will surely be able to find the perfect location for all the places you are searching. Transferring to a new neighborhood has its advantages especially if the area is peaceful and just right for family living. You should take your time when finding a location for building a home. You cannot just decide to live in a particular area immediately. There are various factors which you must consider like your family's safety and security, the crime rate in the area and the type of education system which is being provided for children. Most people say that living in the country side is a lot better than city living, but this would actually depend on you. Additionally, you will want to find out if the water is potable and whether or not you can drill a well. If you cannot tap into the town or village sewer system, you may need to install a septic system. You will also learn about the prices of commodities as well as telephone and Internet services. Nonetheless, amongst the factors to consider when buying plats of land are the zone requirements. You should check with the authorities of the state, city, and county. Find out if there are any restrictions on the area. Make sure you are able to build the type of house you are considering. Some areas place restrictions on the types of homes, sizes of home, etc. You should also consider the topography, the natural hazards, easements, and the appraisal of the land. Consider factors such as elevation, terrain, soil type, and bedrock. If the place is near the hills, it may be prone to landslides. The foundation of your house might crack if the land is not stable. If the place is near a body of water, it may be prone to floods; so, you may need to elevate your house and purchase flood insurance. You should also know if the area is fire hazard. Furthermore, consider whether the land you are planning to buy is easily accessible. You may need to acquire an easement and title insurance. Learn about the maintenance of the roads and the possible costs for upkeep. You may also need to acquire an appraisal if you want to determine a suitable price before you make an offer. Purchasing a piece of land can be an expensive investment, so make sure you look into every possible factor before making a final decision. This article should help you determine what factors to consider when purchasing land. 6 > The Kids Love it.